Wastewater treatment plants are a convenience taken for granted in modern developed communities. Out of sight and out of mind to the extent that the average resident in the industrialized world would be hard-pressed to locate where the local waste treatment plant is. Construction of waste treatment plants is beyond the means for approximately 2.6 billion people living in the developing world. The absence of these facilities forces these people to endure an environment of disease, parasites, increased mortality rates, and an overall decrease in quality of life that comes with a lack of access to clean drinking water. 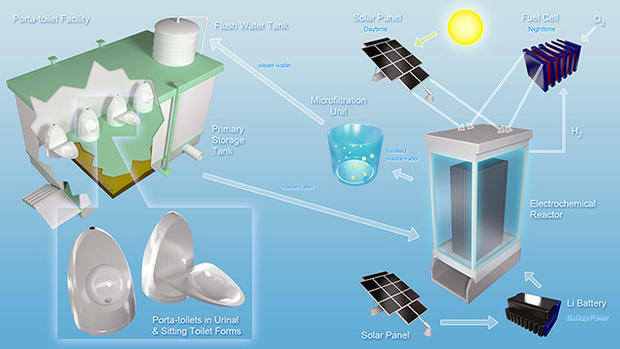 To address this problem, researches with support from the Bill and Melinda Gates Foundation at Caltech developed the Self-Contained PV-Powered Domestic Toilet and Wastewater Treatment System. 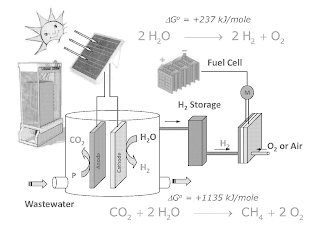 This system utilizes a solar panel which powers an electrochemical reactor which in turn breaks down water and human waste into hydrogen gas. This hydrogen gas can be stored in hydrogen fuel cells. Thus, providing power as well as disposing of waste.